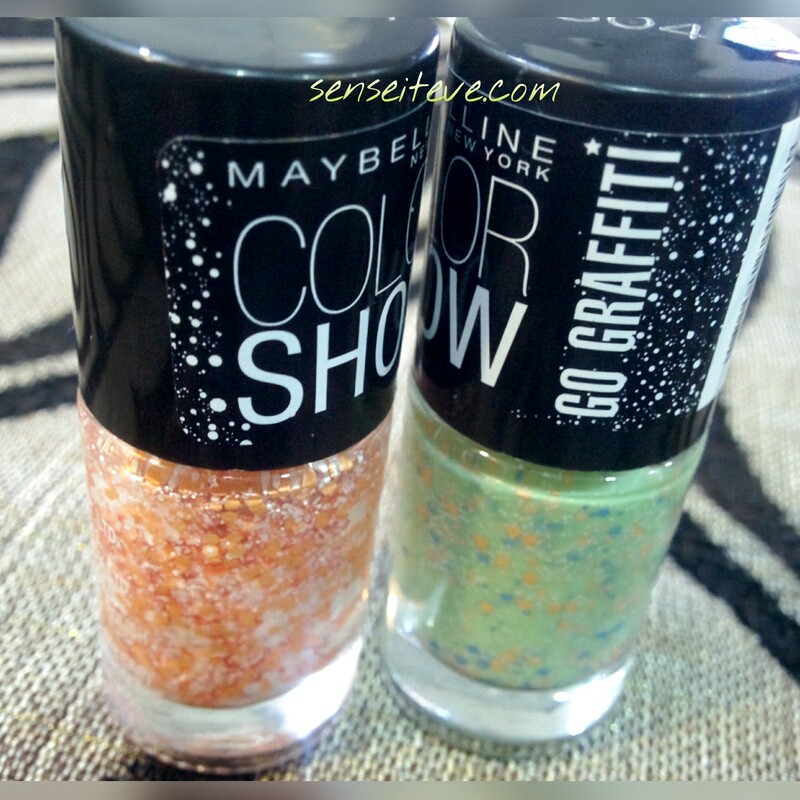 Maybelline colorshow had already been ruling hearts then came glitter mania which was instant hit, now go graffiti which stole my heart already. 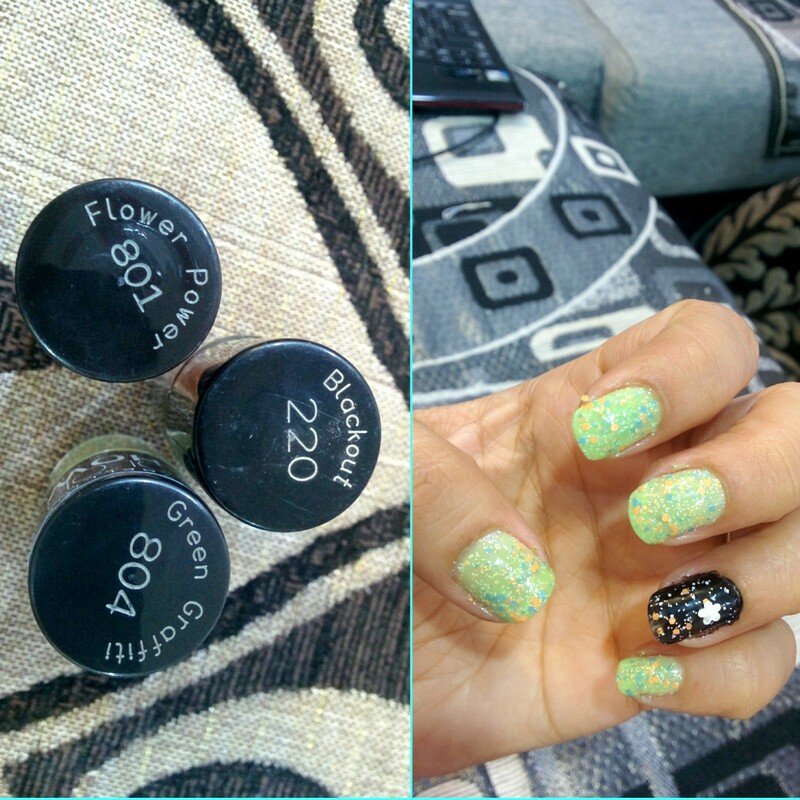 Maybelline says it is “Nailart in a bottle” 🙂 I am here with 2 shades Green Graffiti and Flower Power. Packaging is typical colorshow with a little graffiti polka prints on cap. Brush is good too. Consistency of these nailpaint is bit on thicker side, so leaving cap open for a long time might dry it out sooner. 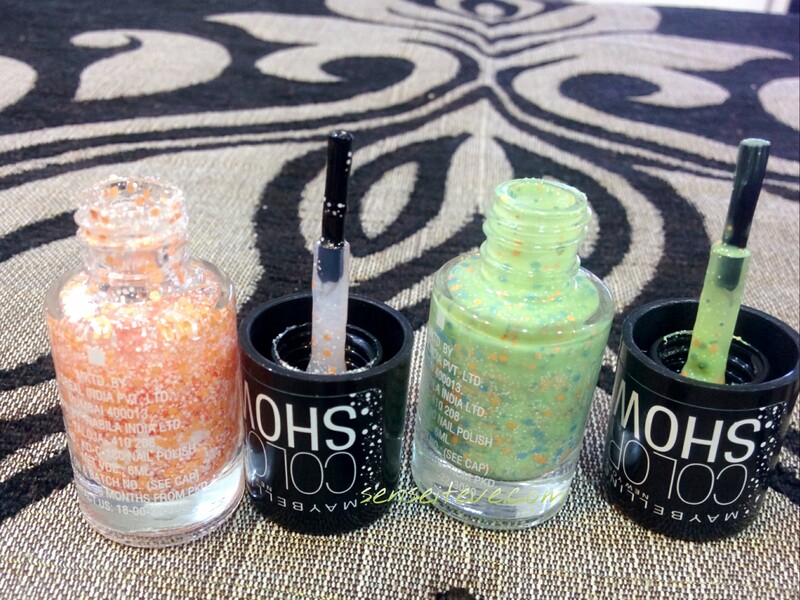 Green Graffiti is a pastel green jelly like polish with orange and blue hexes and white micro beads. 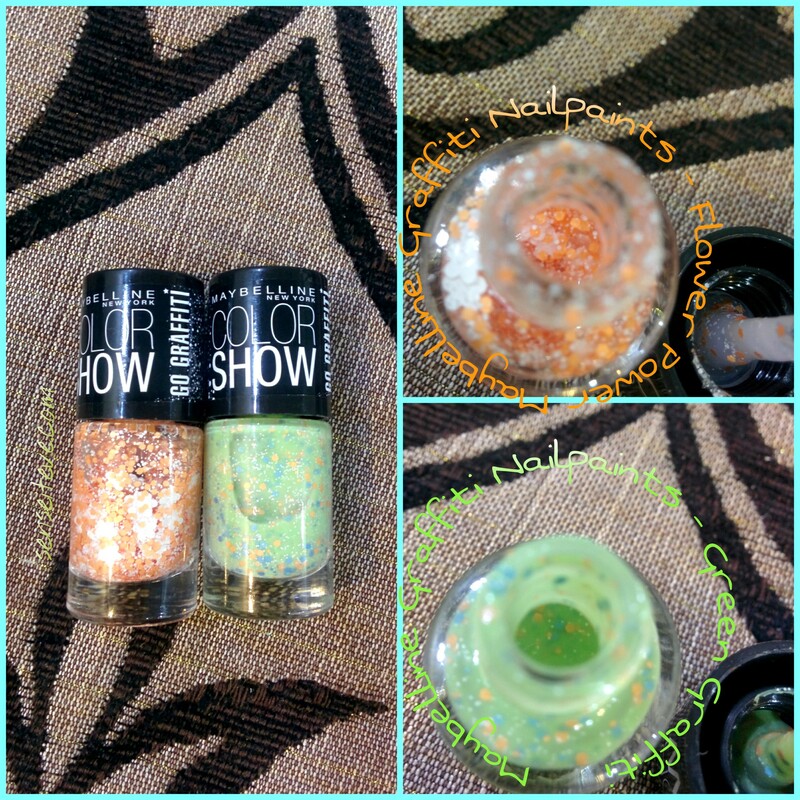 Pigmentation of Green Graffiti is below average and you need atleast 3 coats for opaque finish while Flower Power looks great in one coat but you will have to work a little hard to get flower on each nail 🙂 But the nailpaint dries very fast so layering is not a tedious task. Staying power is max 4 days after which it starts to peel-off like this(Thick consistency and applying more coats is responsible for it. 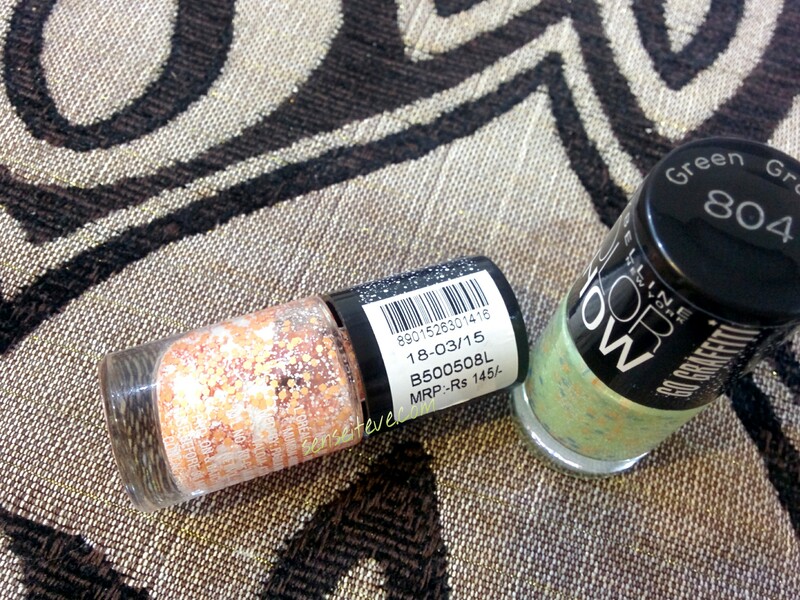 Price of these nailpaints is 145/- INR which makes it reasonable as you are truly getting Nailart in a bottle. Till next time… take care…xoxo. Pics are not loading properly I can see only half of them. Dipti recently posted…Healthy snacks anyone? It’s a shame that I haven’t seen this range here! Is it hard to remove the glitters? I love the shades you picked! So fun! Laarni recently posted…No ifs, ands, or buts: Sigma Beauty 3DHD Kabuki Precision Brush is a catch! both the colors look beautiful…. 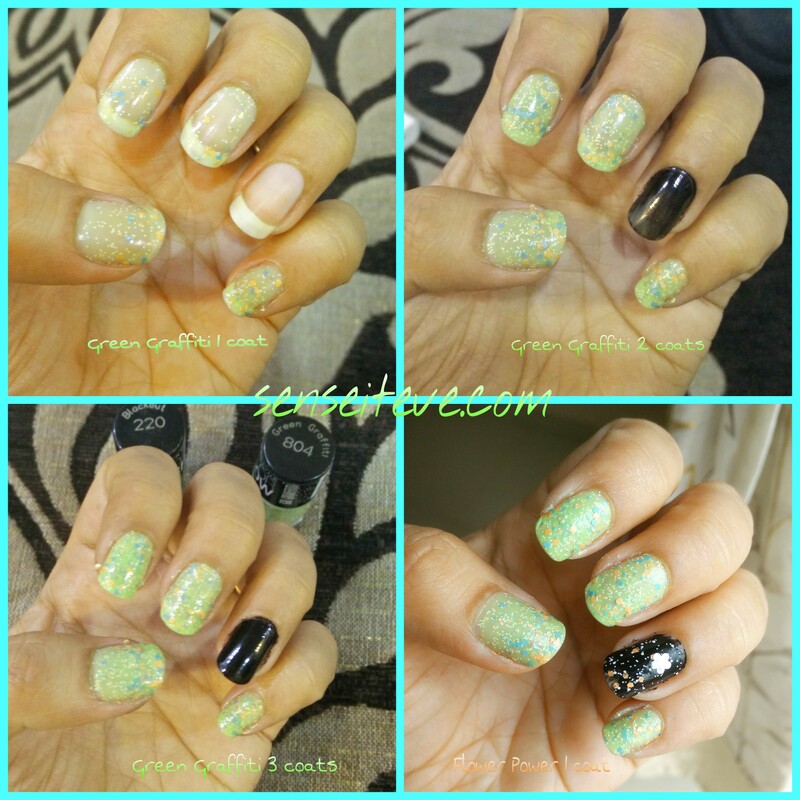 swati recently posted…Hello Autumn: Getting Back in Shape! The orange shade is nice. These are super cute! Awesome for the summer! I love such an honest review!! well done!! Kanu recently posted…#Essentials – must have in bags!! I own flower power and I love how it goes on my nails, but taking out the flower is a challenging task! 😀 I am not a fan of green graffiti though ! Have a nice day beautiful! Nail art, indeed, it’s interesting nail polish.